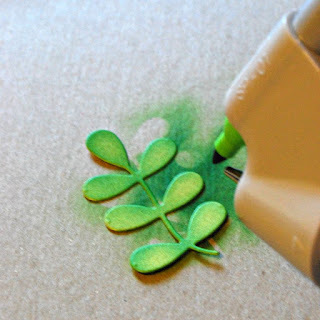 Hey Crafty Friends... I super excited about to today's post!! 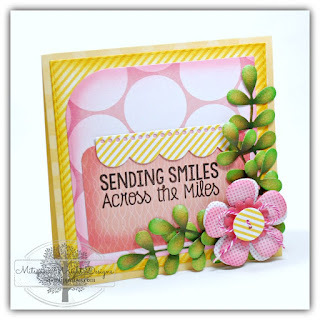 Because I get to showcase dies and stamps from one of my favorite companies ever... My Favorite Things!! EEEKKK!! 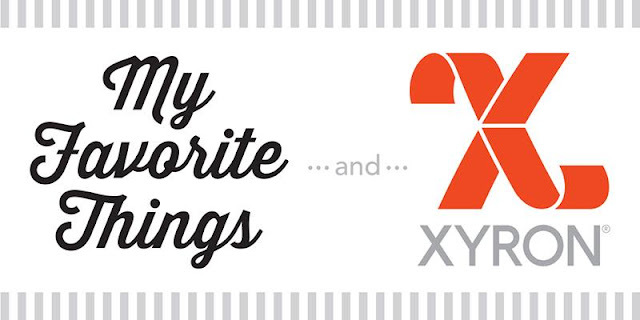 They are teaming up with Xyron to showcase innovation products from 2 awesome companies!! Their designs are absolutely YUMMY!! You will want to gobble them ALL up!! I'm being a good girl and pacing myself but I do have plans for more in the future... in the very very near near future!! LOL I especially plan on expanding my collection of Blueprints Die-namics Dies. If you have never heard of their Blueprints dies you are totally missing out!! Blueprints are A-MAZ-ING!! 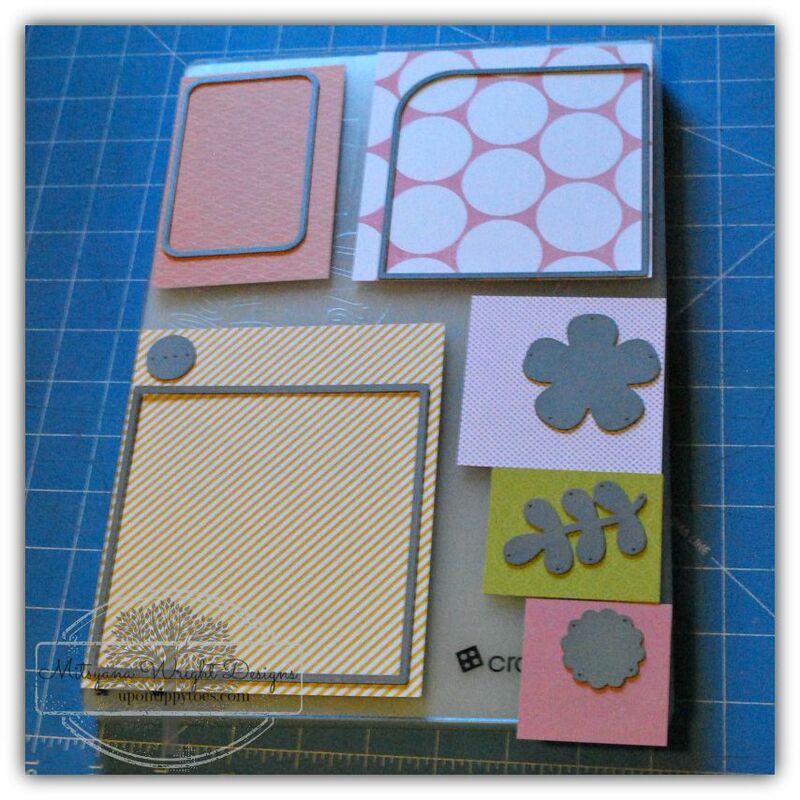 They take the hard work out of card making! Each Blueprints die set comes with awesome dies to build and embellish beautiful cards AND also have downloadable sketches for you to follow. 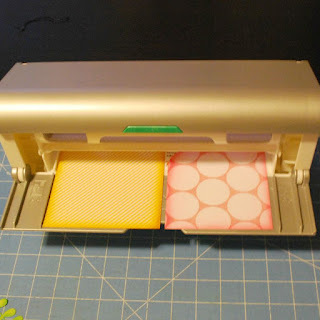 They take the guess work out and all you have to do is choose your paper. 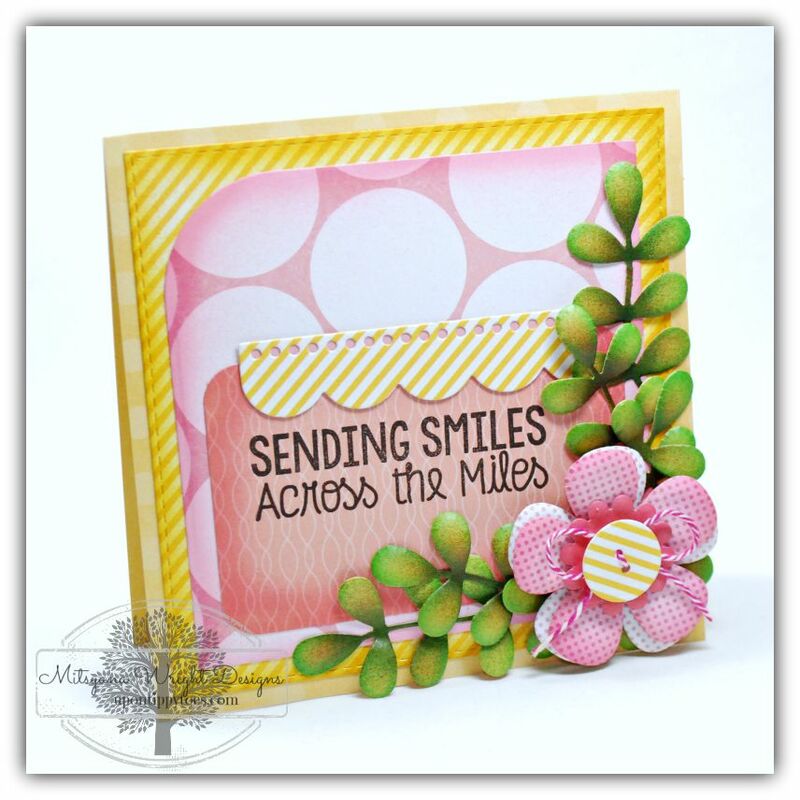 Here I made a card using MFT's Blueprints 14 set. 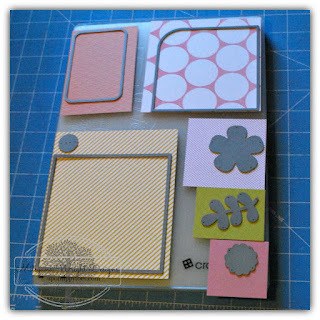 First, using my Cut'n'boss machine and Blueprints 14 dies I cut my patterned paper. 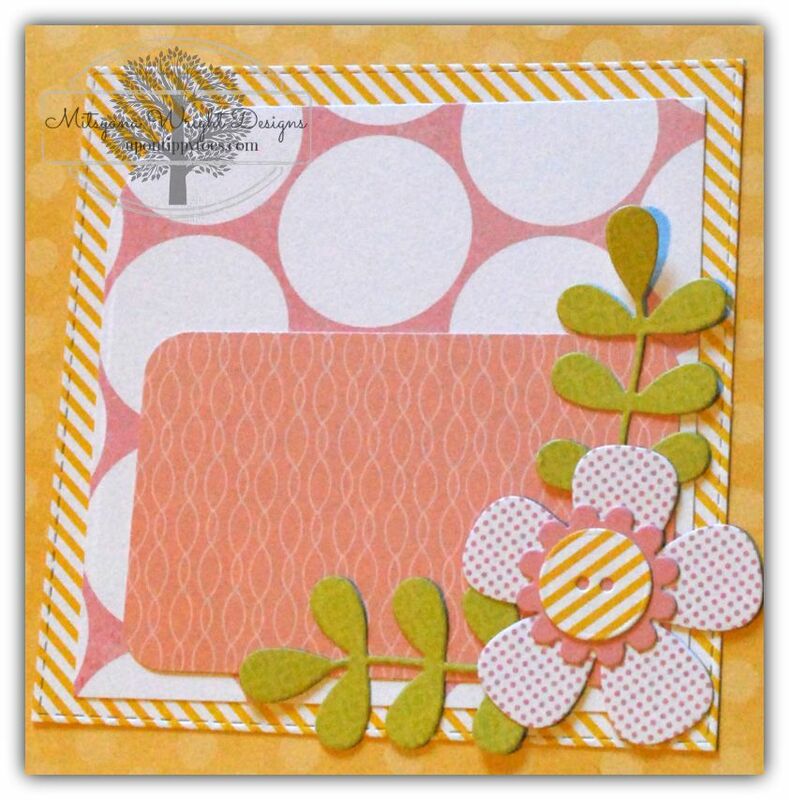 DCWV has wonderful paper stacks that have papers that coordinate beautifully together. And the funny thing is I used two different stack and still the paper coordinated wonderfully together! Awesome! As a designer this added bonus makes creating so much easier and faster to do. I loaded all my des onto my extra large cutting platform... again, another time saving bonus... then ran it through my Cut'n'boss machine. I love that MFT has a Printable Resources section on their website. 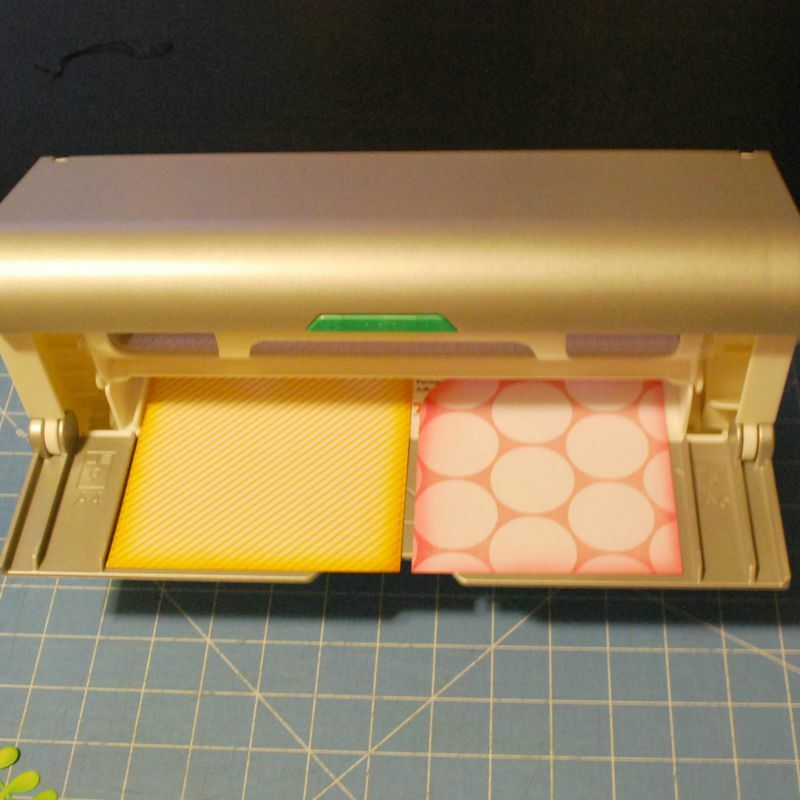 You can download and print sketches for all their Blueprints dies all in one place. And I especially loved the lower left hand sketch found here... it was the inspiration and starting point for my card. But I had to add my own spin on an already fabulous design. So I decided to give it a little more! More FLOWERS, more LEAVES, and more DIMENSION. How did I do that??! I started by ebrushing my leaves to add depth. I did this to a total of 7 stems. It's amazing what a little color will do. 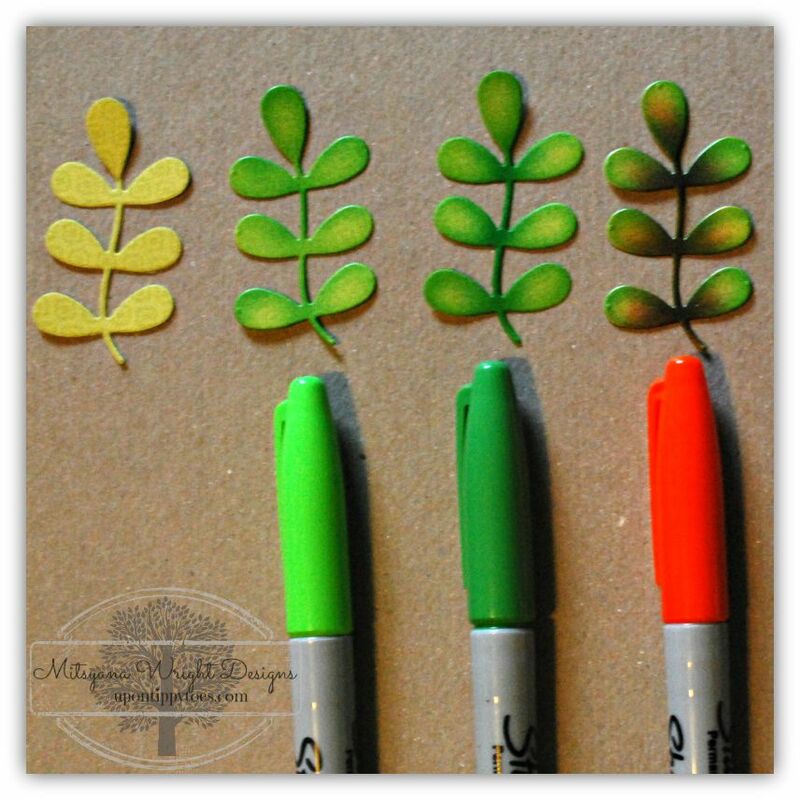 In the above picture I show how I took patterned paper and made it more realistic by airbrushing with 3 different sharpie pens. From left to right - plain patterned paper, paper airbrushed with a light green sharpie, patterned paper airbrushed with lt green and regular green sharpie, and then lastly, patterned paper airbrushed with a lt green, green, and orange sharpie. Just color made huge difference already... but I didn't stop there. I wanted more! More "POP"! 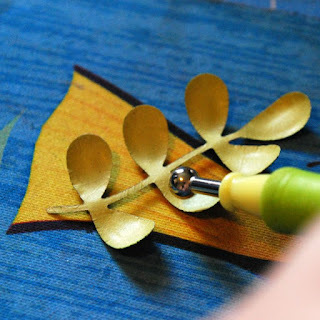 And to create that "pop" I made my leaves 3 dimensional. With a rubber/foam mouse pad and a stylus I domed the back of my leaves by rubbing in a circular motion around the edges. 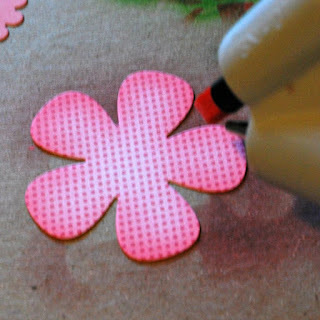 And, you know I can't have dimensional leaves without having dimension in my flower too!! So I repeated the process that I did with the leaves onto my flowers... except I only used 2 of the large flowers and I airbrushed them using Spectrum Noir markers in FS7, and CR3. Then also added more dimension to my flowers... flipped them over and, in a circular motion, embossed around the edges of the petals. 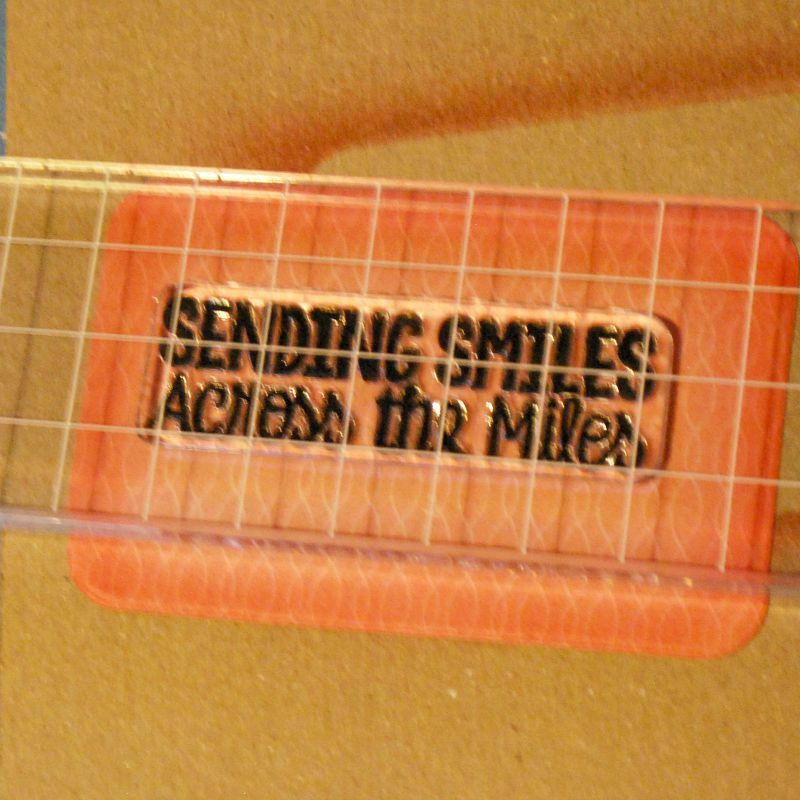 I also airbrushed around the edges of each card panel. 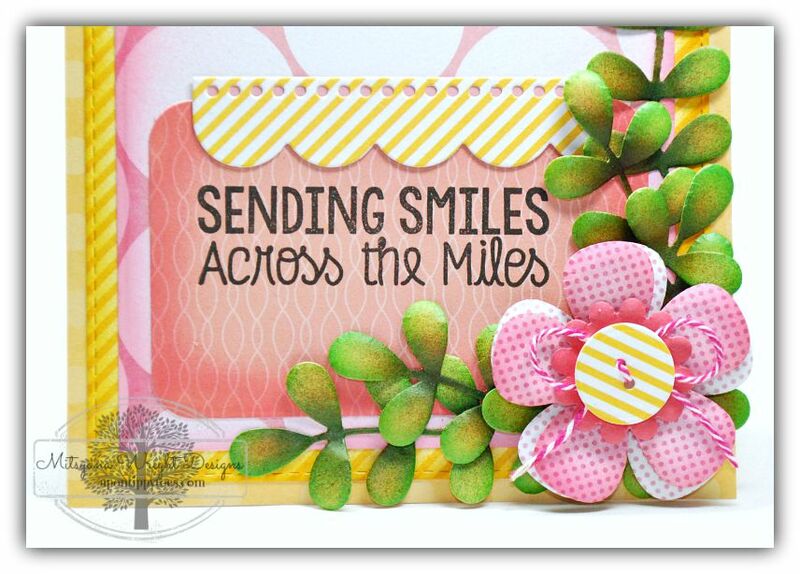 I love this sentiment from MFT's You've Got Mail Clear Stamp set. I have many family friends who I love and miss dearly back in Hawaii. 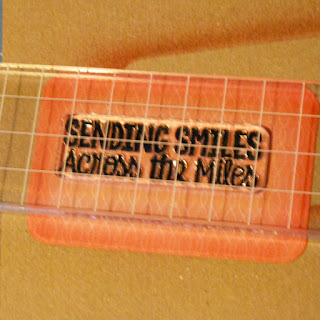 Talk about hitting home... "Sending Smiles Across the Miles"... there are literally thousands of miles between us. 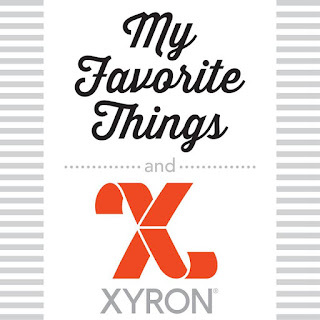 I then ran my panels through my Creative Station by Xyron... This makes applying adhesive a breeze. Just run through, peel, and stick!! And I never have to worry about pieces falling off because the adhesive is super strong. 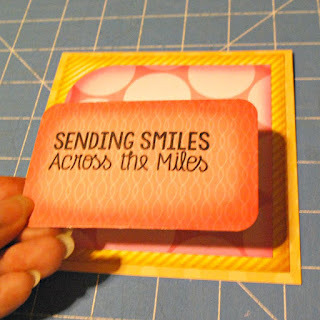 Which is perfect because I tend to make my cards super bulky! 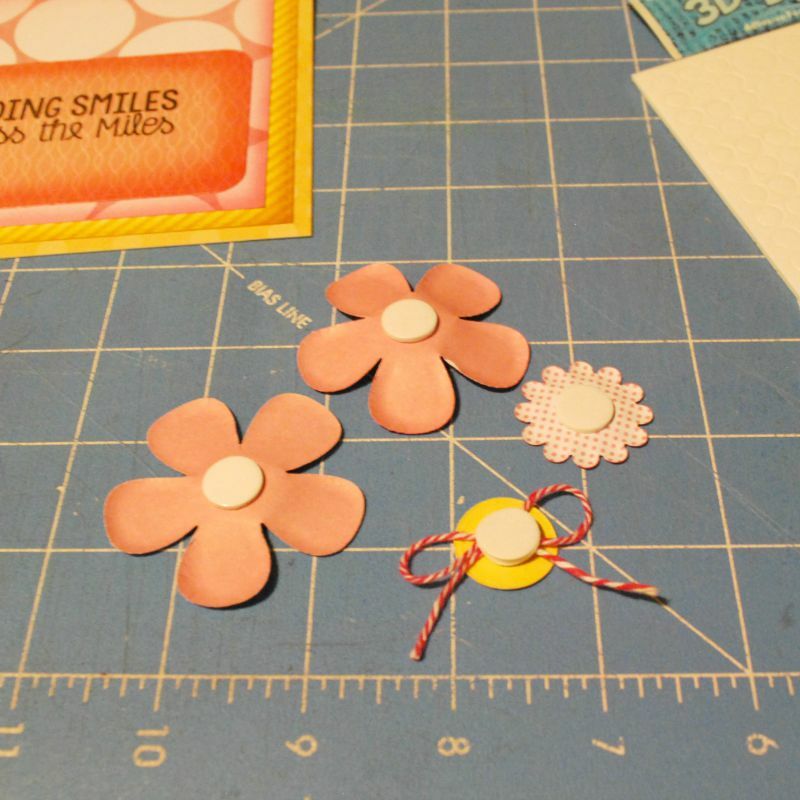 To attach my flowers I used 3D dots behind each piece and layered each on top of each other. 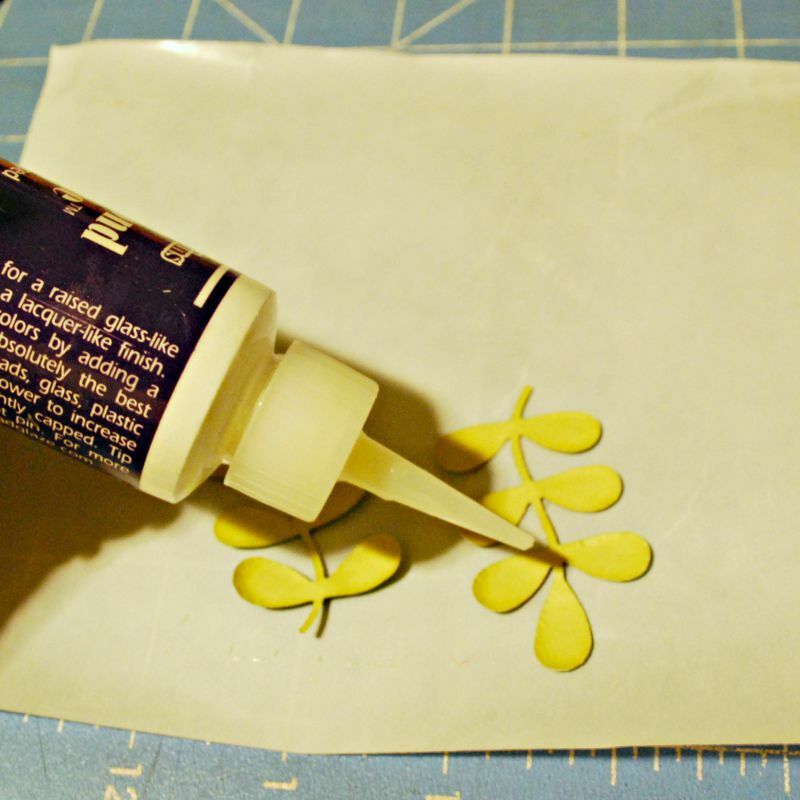 To attach my leaves I used a thin line of Diamond Glaze behind the stems and a small portion of the leaves. I loved the stitched details in the large card panel! 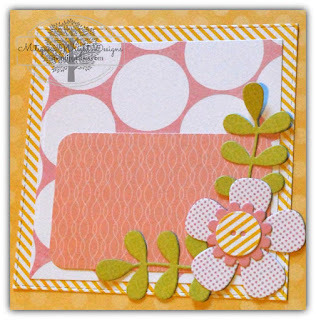 I also love the peek-a-boo dots in the scalloped edge border die!! 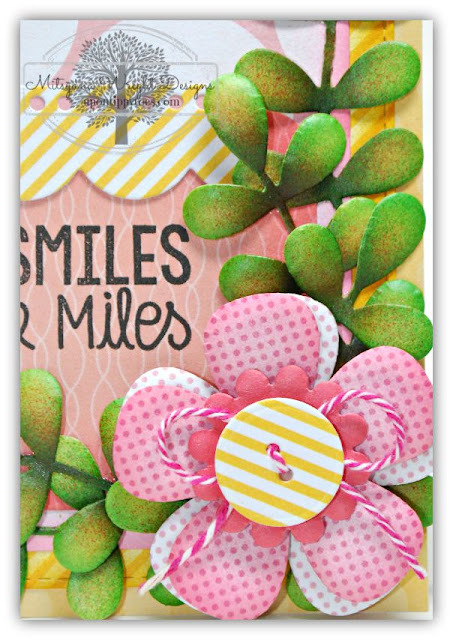 There are so many layers in this card!! I just love how it came out!! Thank you MFT and Xyron for making it easy for me to look like I'm a creative genius! Love all the pictures and instructions. I sure can learn some tips! I am a new follower...Lee-Ann sent me over! Can't wait to see more! You did an wonderful job on the shading of the leaves and flower. 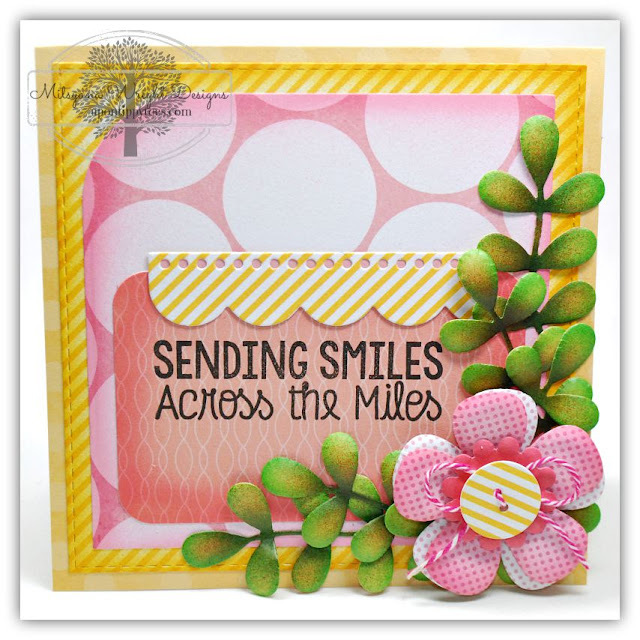 Lovely project, I enjoyed looking at your step by step instructions!